In the Goldrush Era in the 1860’s, John and Mary Garrett travelled from Beechworth to the new find in the Upper Goulbourn Valley. They established themselves at a place then known as Macs creek. In 1862 they opened on the banks of the Goulbourn River a beerhouse, simply known as Garretts Beerhouse. The horse trail passed right by the front of the beer house servicing the hoards of thirsty miners in the district. 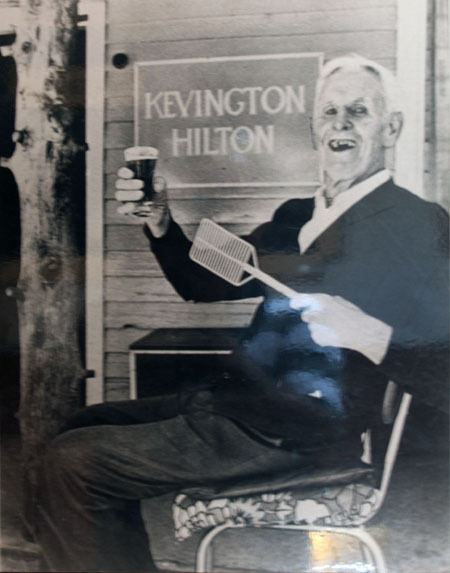 As time went by, the beerhouse became known as the Kevington Hotel, as trade had been very good allowing John and Mary to establish the Hotel into a permanent stopover with accommodation available. John and Mary had 11 children and the Hotel remained in the same family ownership until 1957, almost a century in the same family. Over this time the hotel was known as Garretts Beerhouse, The Polar Hotel and the Kevington Hotel. The Hotel was purchased by Clarence and Elsie Poole in 1957 who had come into the area in 1932 and operated the Ten Mile Hotel until its demise in the 1939 fires. Clarrie and Elsie also had 11 children in their charge, so the hotel was a real family affair. The hotel was in their ownership until Elsie’s passing and was sold out of the Poole Family in 1986. In 2007 after 21 years and three different owners and numerous lessees , the hotel was purchased by Lyn-Maree and Wayne Poole, Wayne being the grandson of Clarrie and Elsie. Since then, they have lovingly restored the hotel and upgraded the kitchen and dining room area so customers can sit and relax and picture what life would have been like 150 years earlier. The Kevington Hotel is the last remaining example of a hotel built in the goldrush era of the 1860’s in the Upper Goulbourn region. Lyn-Maree and Wayne welcome you to come and enjoy our hospitality, have a meal or relax out on the river bank and enjoy a drink or snack whilst watching the abundant birdlife as you watch the clear water meander past.